Step 1: Make up the salted caramel sauce (recipe found here). I made this the day before and left it in the fridge – I wouldn’t recommend doing this. If you can make it just before you make this recipe as it will be much MUCH easier. Step 2: Make space in your freezer for your baking tray/chopping board or whatever you plan on using to place the marshmallows on to take in and out of your freezer throughout this recipe. *Note it must be a flat surface. I used a chopping board. Step 3: Line the baking tray/chopping board/whatever you are using (i’ll refer to it as baking tray for the rest of the recipe) with baking paper. 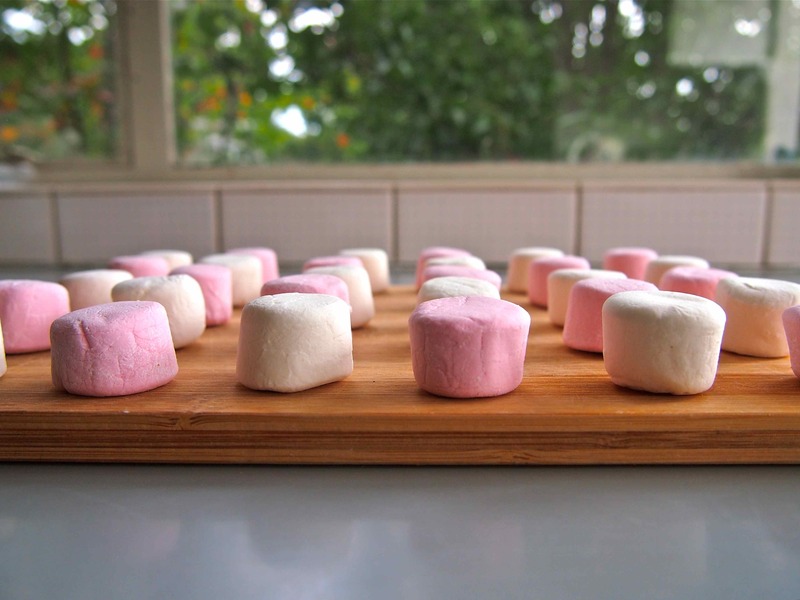 Step 4: Line the prepared baking tray with marshmallows and place in the freezer for approx. 15 minutes or until the marshmallows have hardened. Step 5: Set the salted caramel sauce down on the table next to you – you are about to use it. Step 6: Bring the baking tray out of the freezer. Carefully dip the bottom of each marshmallow into the salted caramel sauce and then place the marshmallow back onto the baking tray. *Note it might be easier to stick a toothpick into the marshmallow in order to dip it into the sauce. Don’t let too much caramel drip off of the marshmallow before you place it back on the baking tray. Step 7: Repeat Step 6 with each remaining marshmallow. Once all marshmallow’s have been dipped in salted caramel sauce and placed back on the baking tray place the baking tray back into the freezer and let set (this should take approx. 15 minutes). *Note when I did this the caramel never hardened but did slightly solidify. Step 8 (Optional): Drizzle any remaining salted caramel sauce over the top of the marshmallows for a store-bought look. 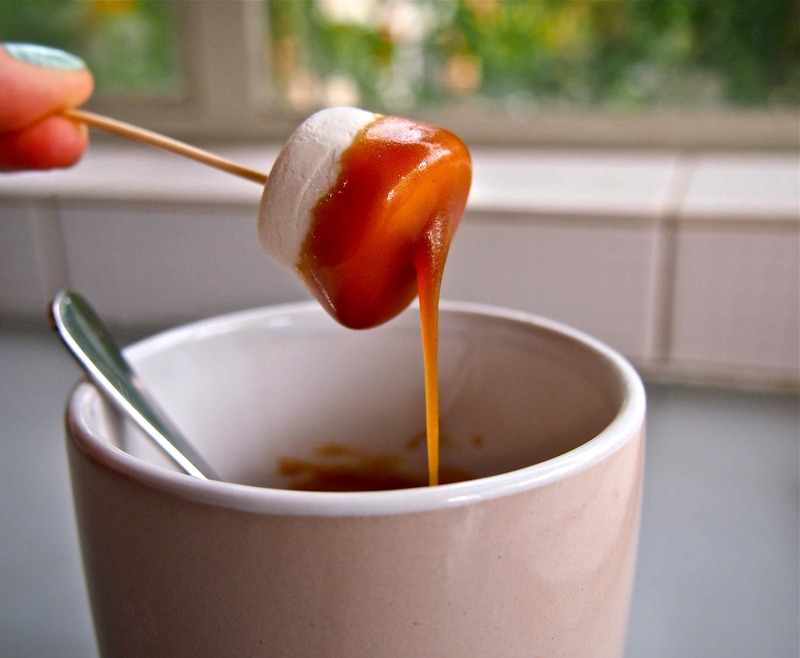 You can do this by dipping a toothpick into the salted caramel sauce and flicking it over the top of the marshmallows. Step 9: Once the salted caramel has set on the marshmallows, melt some of your chocolate in a bowl in the microwave. Do this in 30 second batches. After every 30 seconds take the bowl out of the microwave, stir the chocolate and check if it has completely melted. 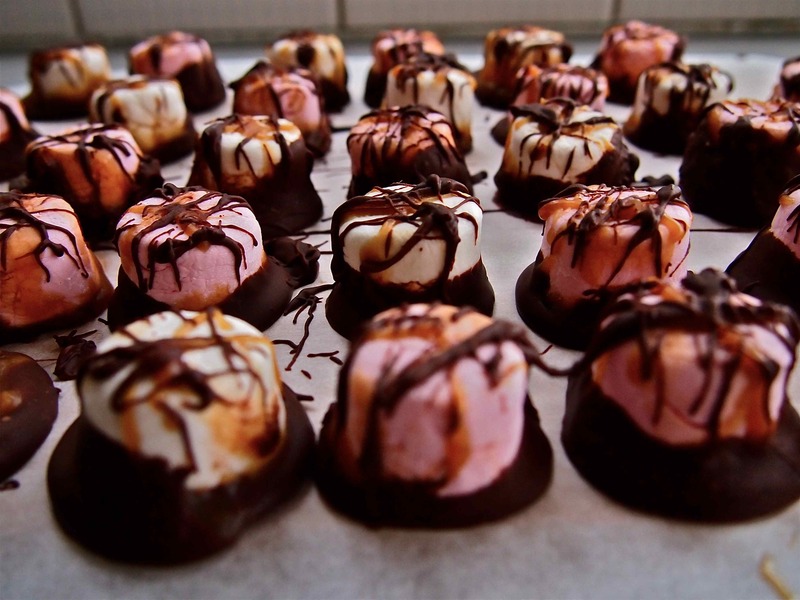 Step 10: Dip each marshmallow in chocolate in the same manner you dipped it in caramel (just like in Step 6). Once you have dipped the marshmallow in chocolate place it on the baking paper. Once you have used all the melted chocolate up, pour more chocolate into the bowl and repeat until all the chocolate and/or all the marshmallows are covered in chocolate. *Note make sure the chocolate covers all of the salted caramel as the caramel will likely melt in heat but the chocolate shouldn’t. 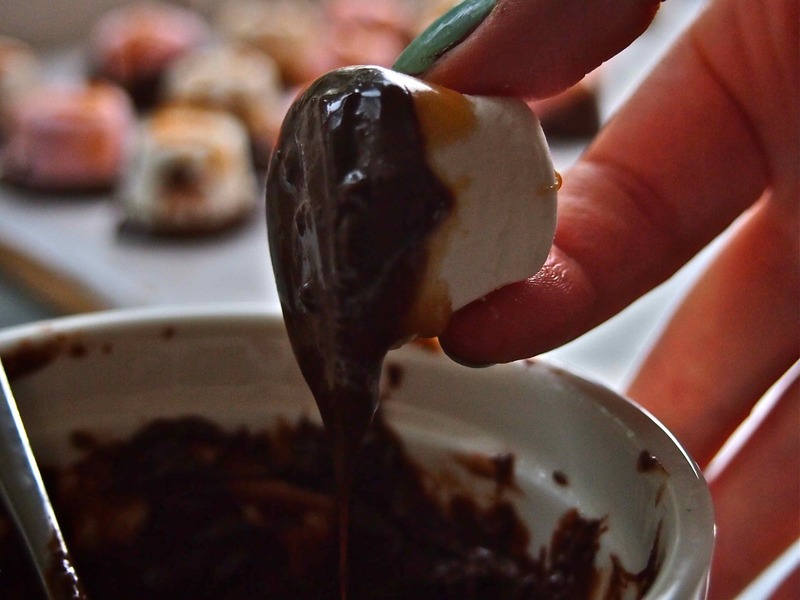 Step 11 (Optional): Drizzle any remaining chocolate over the top of the marshmallows for a store-bought look. You can do this by dipping a toothpick into the chocolate and flicking it over the top of the marshmallows. Step 12: Place the baking tray back into the freezer for approx. 15 minutes or until the chocolate is frozen. Step 13: Once the chocolate has hardened it is ready to be served and eaten. Step 4: Lay marshmallows out on flat transferable surface. Step 6/7: Dip each marshmallow into the salted caramel sauce. 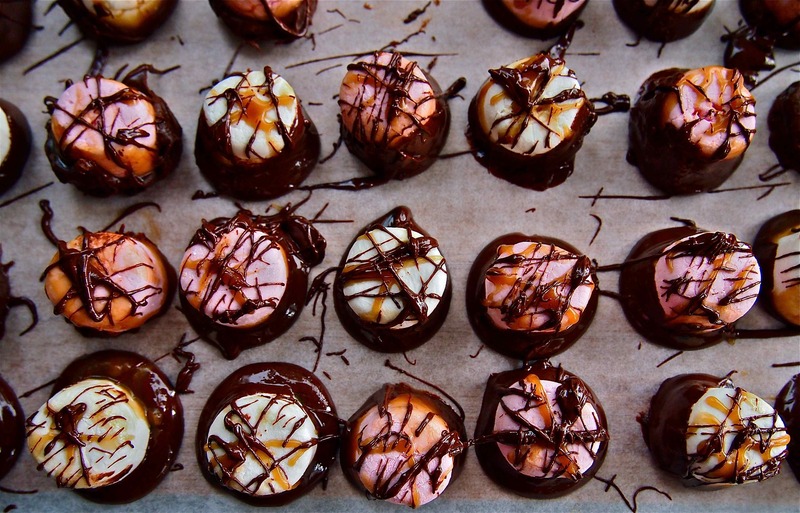 Step 10: Dip each marshmallow into the melted chocolate. Step 11 (Optional): Drizzle chocolate over the top of the marshmallows. Step 13: Once the chocolate has hardened in the freezer, eat and enjoy! Potsies – want extra salt on this? If you want a little bit extra salt you can sprinkle it a tiny bit on top of the marshmallows after you have dipped them into the chocolate – I would try it on one first to decide if you like how it tastes before doing it to the whole batch! This is such a great treat or gift idea! I hope you enjoy these delicious marshmallows as much as everyone who has tried them has :). P.S This recipe has been minimally altered and was originally created by Baker By Nature and found here. They taste better than they look if that is possible :). OMG. My daughter saw these over my shoulder just now and is committed to making them. Haha I love it! I hope she enjoys making them. I found the hardest part to be not eating all the marshmallows while I was making it. Let me know how it goes :). Your blog is beautiful and this looks delicious! Thank you Tanya 🙂 – it tastes delicious as well. Thank you! The ‘classy’ part of it is surprisingly easy to do :). This looks soooo good! Loving! This looks and tastes amazing :). I just HAVE to pester mom to make it. Looks too good to resist! I think potentially the only thing better than having these is not having to make them and still getting to eat them :). They look so delicious! I want them!! Haha if you make them let me know how you go with them :). Thanks 🙂 they also taste so amazing. 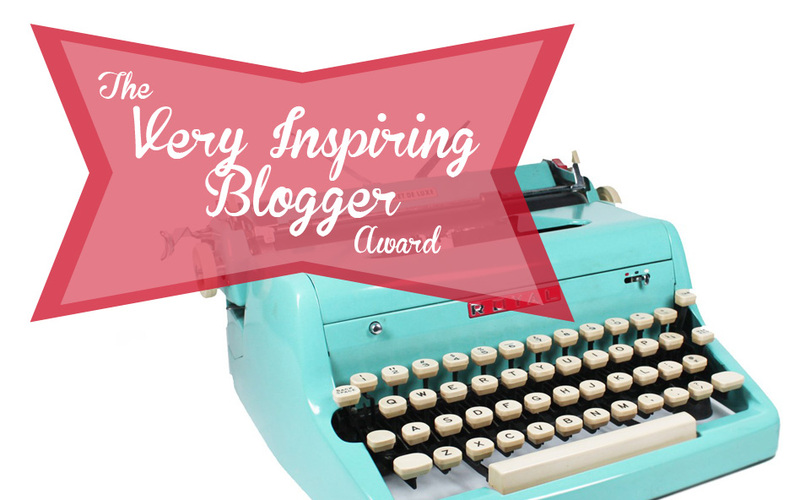 Your blog makes me drool. Thank you so much CurvyLou! I hope you enjoy making the recipes – you must let me know how you go when you try one out :).